There are various unique sorts of mikoshi in each region of Japan. The Maui Mikoshi Design Contest is one of the highlighted events of the 11th Annual Honolulu Festival, which is held for high school students in Maui. This year’s winning school was Lahainaluna High School. The students of Lahainaluna High School will be visiting Honolulu on weekend and they will be presenting the Maui Mikoshi at the Grand Parade, which will be held on the final day of the Honolulu Festival. In addition, their Maui Mikoshi will be exhibited in the lobby of Waikiki Beach Marriott Resort & Spa during the festive week. Mr. Makoto Imanaka and Mr. Roberta Keneshiro, who are the parade officials were finalizing the Maui Mikoshi, which was designed by the students of Lahainaluna High School. Its uniqueness is the golden lanterns and torches. 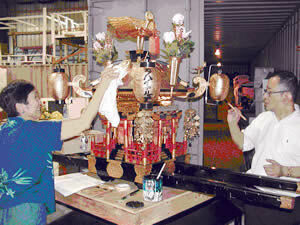 Mainly, the Maui Mikoshi was colored in red since it is the color of Lahainaluna High School. Also, its ornaments were colored in gold. 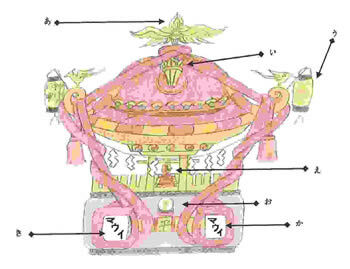 The shape of the Maui Mikoshi is traditional because it was designed as a symbol of mikoshi in each region of Japan. 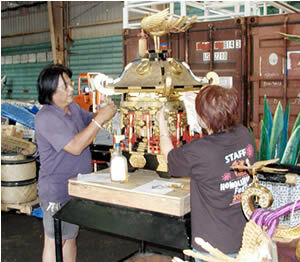 Hence, we focused on maintaining the traditional shape of Japan’s mikoshi. Then, we decorated our mikoshi with the unique ornaments, so that people can recognize that it is the Maui Mikoshi at first glance. Furthermore, Lahainaluna High School’s “Mikoshi of Peace” was structured by Mr. Nelson Fujio, who is a director of the Grand Parade and also Mrs. Diane Fuijo, who is in the parade committees. Its design symbolizes the West Maui Mountains, peace and also the “Flaming Torch of Excellence”, which is the emblem of Lahainaluna High School.